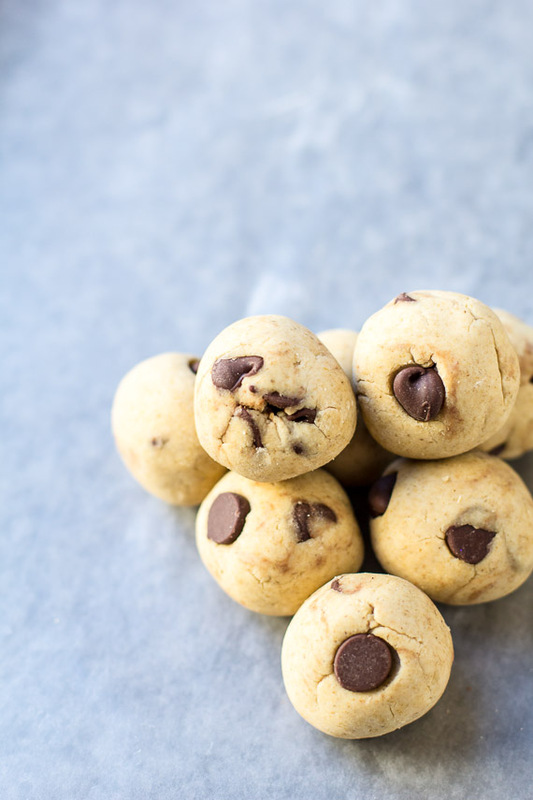 An easy, one-bowl recipe for chocolate chip cookie dough rolled into bite sized servings. Only 49 calories! These chocolate chip cookie dough bites are perfect for anyone who loves sneaking bits of raw cookie dough from the bowl, like me! They’re sweet and have the perfect ratio of chocolate to dough. This 6-ingredient recipe starts with butter, and vanilla, and is sweetened with stevia. Alternatively, you can use coconut oil to make these bad boys vegan. Oh, and don’t forget the chocolate chips that makes them complete. Swoon. Once you have your “dough,” it’s time to roll it out into bite sized balls for snacking. When your sweet tooth kicks in, having delicious and healthy snacks available at your fingertips can be the perfect solution to curb those cravings and avoid a high calorie indulgence. These Chocolate Chip Cookie Dough Bites are super easy and satisfying. I hope you all love these and that they give you just the boost you need to carry on your day. Place a sheet of parchment or wax paper on a baking sheet. In a bowl, stir together the butter, vanilla, stevia, and almond milk. Place in the microwave on high for 30 secs to 1 minuet to warm the milk and melt the butter. Give everything a good stir to incorporate. Stir in the oat flour and salt until everything in combined. Fold in the chocolate chips with a spatula. Roll into bite-sized balls and place on baking sheet. Store extra bites in an airtight container in your fridge. Enjoy!